Thanks to the skills and dedication of Warwick-area firefighters, emergency medical technicians, paramedics and police officers, an elderly local lady survived cardiac arrest and a baby boy will one day be able to tell the story of the part our Hometown Heroes played in his birth. On Tuesday January 14, members from Warwick EMS, Rothsville Volunteer Fire Company, Rothsville Volunteer Ambulance Corp. and Northern Lancaster County Regional Police Department responded to a reported cardiac arrest in Warwick Township. Units arrived to find an elderly female in cardiac arrest. Immediately, the crews performed High Quality CPR, while the on-scene paramedic provided advance care life support. After working the patient for more than 15 minutes, a spontaneous pulse was restored. The patient was then transported to Lancaster Regional Medical Center. Providing High Quality CPR has proved to enhance survivability of victims suffering from sudden cardiac arrest. It requires professional training, and a strong “team” effort with crew-members rotating through various cycles of cardiac compression while assisting with ventilation efforts. These activities must occur without interruption while treating, packaging and transporting the patient. A week later, on Tuesday January 21, three members of the Rothsville Volunteer Ambulance Corp. responded to a report of an obstetrics emergency at a market/gas station in Warwick Township. The crew of Ambulance 24-1 arrived to find a 42 year-old female quickly moving to the final stages of child birth. Crew members rapidly began transport to the appropriate medical facility. But the baby decided not to wait. In route to the hospital, crew members assisted the mother in the safe and successful delivery of a healthy baby boy. These members continued to provide a high quality of patient care to both the child and the mother until arrival at Lancaster General Health. Mother and child are doing fine. The Hometown Heroes responsible for these lifesaving events were recognized during a ceremony February 17 at Brickerville Fire Company. Award presentations were made by Warwick Emergency Services Commission (WESC) coordinator Larry Schultz. “Warwick Emergency Services Commission is privileged to recognize our Hometown Heroes. These folks, serve our communities 24/7 365 days a year and do this while working full time jobs, attending school, raising families and a host of other activities. 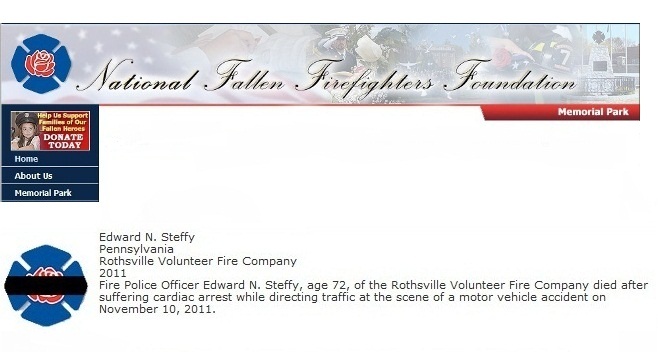 Their commitment to serve others is remarkable and often unnoticed,” Schultz said. Schultz added that new volunteers for our fire and ambulance companies are always needed. “We welcome potential volunteer inquiries from all our neighbors. There’s no obligation. Click here for a preliminary online application, or call 626-8900 for more information. 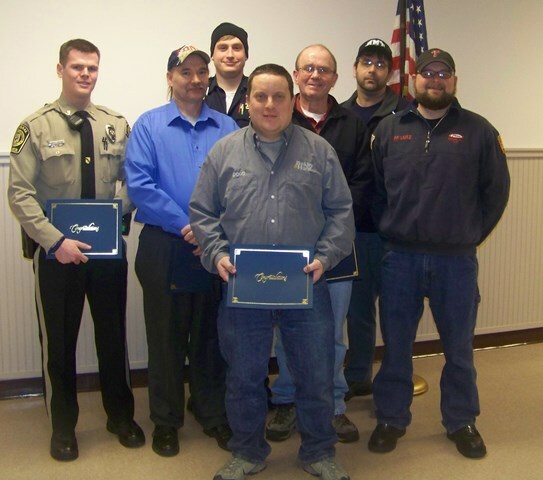 Among those honored for their skill and heroism during a January 14 emergency were Officer Eric Freas (NLCRPD), WEMS EMT Ed Montalvo and Paramedic Corey Felker (WEMS), plus Rothsville Volunteer Fire Company’s Firefighter Doug Bollinger, Driver Dennis High, Captain Elvin Zimmerman and Lieutenant Jason Lutz (Rothsville Fire). 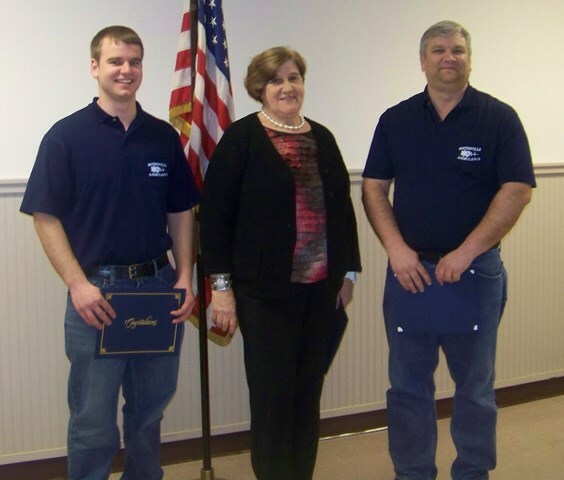 Recognized for their proficiency in emergency medicine during a January 21 premature birth were Rothsville Volunteer Ambulance Corp. EMTs Justin Martin, Beth Runk and Lester Martin.